The early phase where blinds are small relative to the stack sizes. The late phase where blinds are large relative to the stack sizes. Winning tournament players know the best strategy for beating tournaments is to play solid poker during the early phase, then play aggressively in the late phase. That’s because in the late phase the blinds become significant and you must aggressively steal blinds to survive. The late phase is where the majority of the chips are won. It is dominated by all-in raises designed to steal the blinds. Learning how to play well in the late phase is the single most important skill you must have to win poker tournaments. This is where the SitNGo Wizard can help. The SitNGo Wizard will teach you how to play a near perfect late game strategy. You will learn when to push and when to fold. 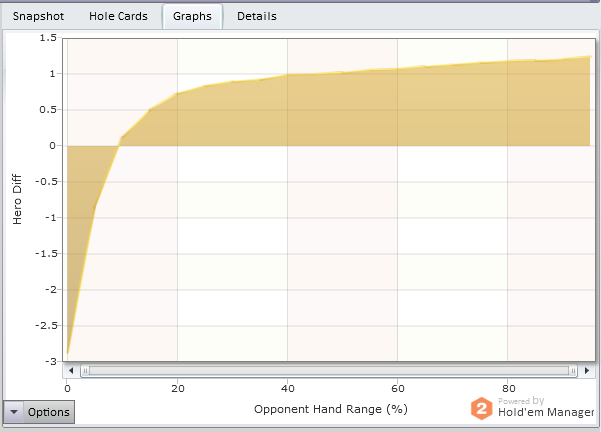 You will learn the importance of various factors such as number of opponents, stack sizes, and opponent calling ranges. If you are a beginning player or just new to SitNGo tournaments, the SitNGo Wizard will quickly turn you in a winning player at the low limit SitNGo’s. If you are already an experienced SitNGo player, the SitNGo Wizard will help you find and eliminate costly mistakes that you don’t even realize you are making. 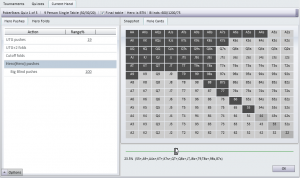 The SitNGo Wizard reads your tournament hand history and runs an analysis of each hand. The analysis compares the equity you would have if you fold pre-flop to the equity you would have if you push all-in pre-flop. Equity is your share of the prize pool at any point in the tournament. It is based on number of opponents, the size of each player’s stack, and the tournament prize structure. The software computes the equity of every possible outcome of the hand. It combines the equity of each outcome with the probability of each outcome to come up with the total equity. It would take you days to do these calculations by hand, but the SitNGo Wizard computes them in a fraction of a second. 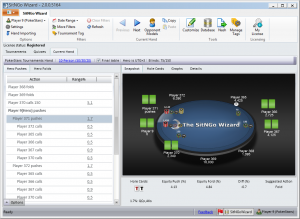 The SitNGo Wizard automatically loads entire hand histories from Party Poker, PokerStars, Full Tilt Poker, Ultimate Bet, Absolute Poker, Titan Poker, PKR, World Poker Exchange, and the OnGame Network. Support for additional poker sites will be added based on customer requests. The tournament view (click to view full size image) displays a summary of each game in the tournament. It highlights games where your decision was close or even incorrect, so you won’t waste time on trivial hands. Double-clicking on a hand in the tournament view activates the current hand view. The analysis compares your equity when you push to your equity when you fold and tells you which play is more profitable. The SitNGo Wizard doesn’t just analyze your hole cards. It analyzes all possible hands so you can see exactly what range of hands you can play in any situation. There are many occasions when it is correct to push with any two cards. Learning to recognize these situations is crucial to SitNGo success. Taking the analysis a step further, you can generate charts (click here to view full size image) that compare different game parameters to your playable hand range. The charts alone can save you hours investigating “what if” scenarios. The game chart (click to enlarge). 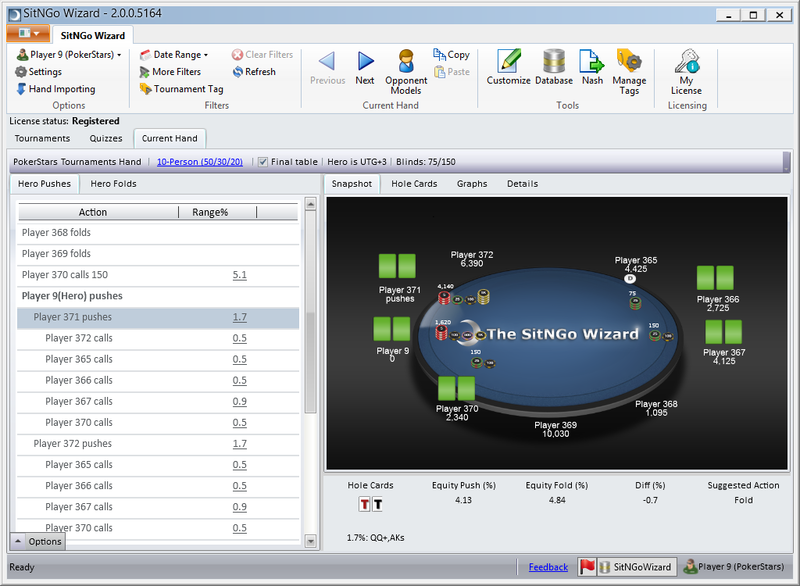 The SitNGo Wizard can analyze almost any pre-flop situation. Suppose two opponents just call the big blind in front of you. The SitNGo Wizard estimates the range of hands with which each opponent limped and the range of hands with which each opponent will call your all-in push. You can easily change any opponent’s hand range estimate. Based on the estimates, it instantly calculates the range of hands with which you can push. The SitNGo Wizard can analyze any number of pre-flop limpers, raisers, or callers. 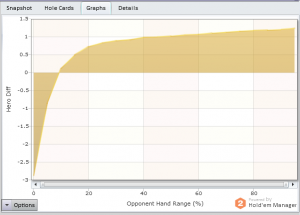 It can analyze hand with up to two all-in opponents. In fact, about the only scenario the SitNGo Wizard can’t handle is when three or more players push all-in in front of you. How often does that happen? The SitNGo Wizard’s quiz mode may be its single most valuable feature. The quiz mode generates random games and asks you to pick the correct play for each game. It is like having flash cards for sitngo’s. A quiz hand (click to enlarge). Each quiz game provides you with a complete pre-flop situation including stack sizes, blinds, any previous action, opponent opening ranges, and opponent calling ranges. You are asked to select a hand range with which you would push or call a push. A few minutes a day is all it takes to start seeing stunning results. After each session, start up the SitNGo Wizard and review questionable hands. At first, you will probably have many questionable hands to review each session. As your short stack play improves you will start seeing fewer questionable hands each session. Eventually, you may see so few mistakes that you will be tempted to stop reviewing hands altogether. Don’t fall for this trap! No matter how good your short stack play becomes, you will always be able to find a few hands that you are not sure about. Additionally, you may begin to pick up bad habits without realizing it. Constant review is the only way to insure you are always playing your best game. If you are a winning tournament player, the more tournaments you play the more money you make. As you use the SitNGo Wizard to improve your play, you will find that the vast majority of decisions you make become very easy. Rarely will you need to think more that a second or two about a play. 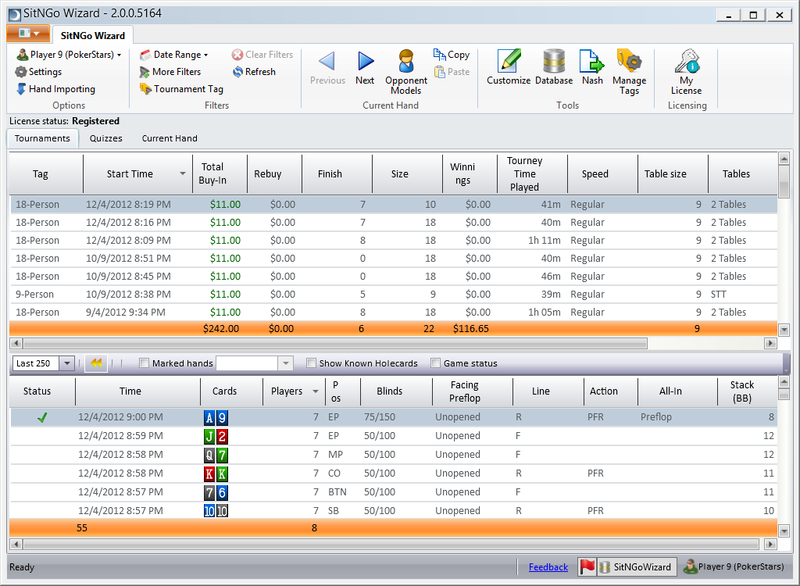 The ability to make correct decisions quickly allows you to play multiple tournaments at the same time. Your profit per tournament will drop slightly because your reads on your opponents will suffer, but your overall profit will soar because you will be able to play many more tournaments in the same amount of time. An additional benefit of playing multiple tournaments is that it is more fun. You nearly always have a decision to make somewhere. You don’t get bored waiting for your opponents to act. 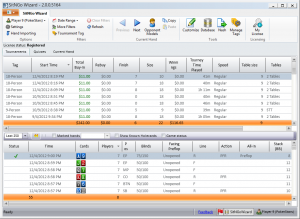 As your play improves and your bankroll grows, you will be able to move up to higher buy in tournaments. Just learning to play the basic SitNGo strategy will make you a winning player at the lower level tournaments. As you move up your opponents get better. Mistakes that you can overcome at the lower levels become more costly. The SitNGo Wizard teaches you how to adjust your play as you move up. At the surprisingly low cost of only $99, we’re sure you will agree that the SitNGo Wizard is an incredible value. It will probably pay for itself within the first week of use. You will have complete access to our free on-line support forums and free software updates. We encourage your suggestions and new feature requests. All suggestions will be carefully considered as we add new features and make improvements. Even though we offer a full money back guarantee, we fully appreciate that even $99 is not a trivial amount. So we’ve made it even easier for you to get started. Try out the SitNGo Wizard FREE for a full 30 days with our compliments. Discover for yourself how the SitNGo Wizard will help you make more money. So it costs you nothing. No worries about making the wrong decision. Click here to download the free SitNGo Wizard 30 day trial.